Wants to be a boss of your own ?, then buy and sell Internet services to a smaller group in schools, cafe’, parks or public areas. This method is simple and self employing, all you need do is to subscribe to some major internet dealers, and then create an adhoc network with your computer, and your will start broadcasting internet wireless signals. You can create an adhoc network as an incentive to to you customers thereby attracting more customer to your cafe’. An Ad hoc network is one way to keep your pocket busy a an entrepreneur. 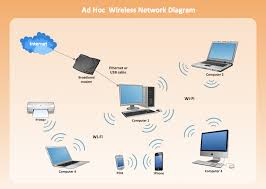 An AdHoc network is a local method by which multiple devices, such as- your phones and laptops within a limited distance, are wirelessly enabled, and allows communication to the internet, without needing a central hub, or base station. Say you had two laptops or so many customers out there in your cafe’. With connection to the Internet in just one Modem,. You could simply create an ad hoc network using your laptop to transmit internet services and share data. When they are connecting to your ad-hoc network they are actually connecting to the device that created the hotspot, so now you have full access to knock, the user out once he or she reaches his time limit. Steps in creating an adhoc network. Click on the search box of the start menu and type “wireless”. Once you have done that you should see a list above and from that select “Manage Wireless Networks” below add a wireless device to this network. A new window opens up. In this window navigate to the “Add” button and click on it. After that click on the option called “Create an ad hoc network”. Once finished you should see a window appearing where you will find a message telling you about Ad Hoc network. In this window click on “Next”. The window that will appear next requires you to give it a network name, security type and the security key. If you wish to use this Ad Hoc network over and over again then check the “Save Network” option. The security type will depend on what the wireless adapter is capable of. In general cases it is found that if you’re only using it quickly with different types of devices it’s easier to have no security. On the other hand if you are keeping it on for full-time use, you’ll definitely want to use security. Once your done with these configurations, you will see a window appearing where you will find a message telling you about Ad Hoc network. In this window click on “Next”. After completing with the above just wait a while for the network to be created. You should receive a message that the network has been created successfully and is ready to use. Your next job is to verify the Ad Hoc network by clicking on the wireless icon on the task bar. You should see the name of the network and alongside it a message “Waiting for users”. Now on the client computer when you click on the wireless connection icon on the network icon, you can see the name of the network and also an option “connect”. Click on the option and connect to the network. Then on the Host computer, you will see that the other computer is connected to your Ad Hoc network. Your Ad Hoc network has been established and you are capable of transferring and sharing files. But what we want to achieve is to establish a network connection, so that, we can share connection with other wireless devices, so then we go to the host’s wireless adapter icon and right click on it. Click on “properties” and subsequently to the “Sharing” tab and select “Allow other network users to connect through this computer’s Internet connection“ that is all. Your network is created and shared, you can now ignite smiles in the faces of your customers. Clicking the “Settings” option you can select the network services the Client machine can access.